DJ BE, AKA BEasy, electrocutes the atmosphere with pulsating charged particles of electrons and protons dancing to diversified sounds that culminate into a show-stopping spectacle of frantic dance moves combusting from bouts of kinetic energy. This non-stop energy is what BE brings to every party. The ability to play sophistication with street, grit with grace and restraint with release that captivates all those under his pull. No wonder he is the iron man of DJs playing everywhere: Internet Radio, Bars, Coffee Shops, Lounges, Restaurants to Dance Clubs. BE’s musical journey dates back to earlier days when he was the “music guy,” the run to guy if you wanted a mix CD of music. By the late 1990’s, he was bitten by the electronic music bug while frequenting dance clubs. Music became a live instrument instead of a spectator’s sport. Open Turntable Sundays at the now defunct Imported Underground initiated the rookie sensation into the world of playing on the 1’s and 2’s in front of cheering fans. With his ear firmly planted to the ground, DJ BE discovered the musical trappings that permeated from a local specialty dance record shop. Then store employee DJ Kai Alce and world-renowned DJ Kemit played mentors. BE forged uncharted grounds. 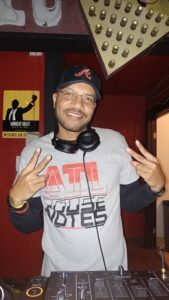 A move that reaped rewards as he was drafted to play for team 4Deep-one of Atlanta’s ever expanding empire of DJ collectives. From that moment, BE’s soundscape toured the urban landscapes of the Sunbelt. 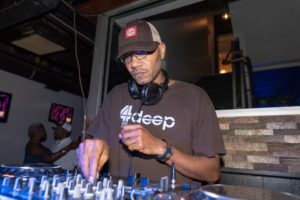 By divine destiny, DJ BE united with another peer DJ Stanzeff to birth one of the most globally acclaimed parties specializing in afro house and deep house music this side south of the Mason-Dixie – TAMBOR. 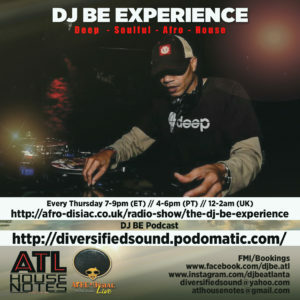 Never to solely rest on DJ status, BE’s Diversified Sound brand extends to the studio creating re-edits, playing FM radio guest, and offering Internet weekly podcasts by playing a variety of palates. Perhaps raised an Air Force brat is why BE’s diversified music taste oscillates from early hip-hop to progressive house/trance to vocal house to soulful house to his latest home of Afro house/Afro-jazz/deep house. To know DJ BE is to know diversity. A Virgo by nature, DJ BE understands his limits. Contrary, his future shows no limits. Wherever BE shoots, he is destined to score. I’ve had the pleasure to play with and open for: Bobi Stevoski, Sean Diaz, Earl McKinney, One Five, Luv Locs, Fiddy Millz, DJ Baby, Deep just Aquabeat, DHM DJ B, DJ Not So Nyce, DJ Nickle B, DJ Nimbus, DJ Rodney C, DJ Deb, DJ Tora , Tracy Levine, DJ Butta, DJ Akema, Ash Lauren, Tony Jakks, DJ Beloved, Jaime 316, Louie Vega, Vic Lavender, Wayne Williams, Alan King, DJ Mes, DJ Kciv, DJ Lil Steven, Chi-Profess, DJ Mack Bango, DJ Royce, DJ Sublime, DJ Silkwolf, DJ Maximus, DJ FunnSoxx, Max Pela, Oscar P, Tyrone Francis, DJ Ant B, DJ Dan Davis, Andrew Marriott, DJ Lox, Djeff Afrozilla, Sabine Blaizin, Terry Hunter, Lynnee Denise, Boddhi Satvi, DJ Spen, Culoe De Song, JoJo Flores, Joe Claussell, Fabio Genito, Timmy Regisford, Ezel, Peven Everett, Anane Vega, Jihad Muhammad, Ian Friday, Osunlade, Ron Trent, Trinidadian Deep, Black Coffee, Jellybean Benitez, Danny Krivit, Ron Pullman, Quentin Harris, Zepherin Saint, Tony Humphries, Louie “Lou” Gorbea, Matthew Bandy, Master Kev, Jamie Thinnes, Ralf Gum, Kai Alce, Kemit, Salah Ananse, Lars Behrenroth, JoJo Flores, Johnny Fiasco, Justin Long, Halo , Reelsoul, DJ Offbeat, Just One, DJ Yusef, Ramon Rawsoul (The Gathering) and Calvin Morgan/Michael Alan (Sweat Crew), Spoon & Mindub, DJ R.E.D, Nabani Banks, DJ Stanzeff, KMixx, Taurus The Bull, Dr. Katz, Rodd Summers, DJ Semper WiFi, Badala B (aka Soul Assassin), Omega Black, DJ Tabone, DJ Ausar, Kevin O, Johnny Davis, Sir Thomas, Harry Chronic, Swift (DJN Project), DJ 1derful, Tre Damit, Gary Wallace, DJ Rsenal and the entire 4DEEP CREW.